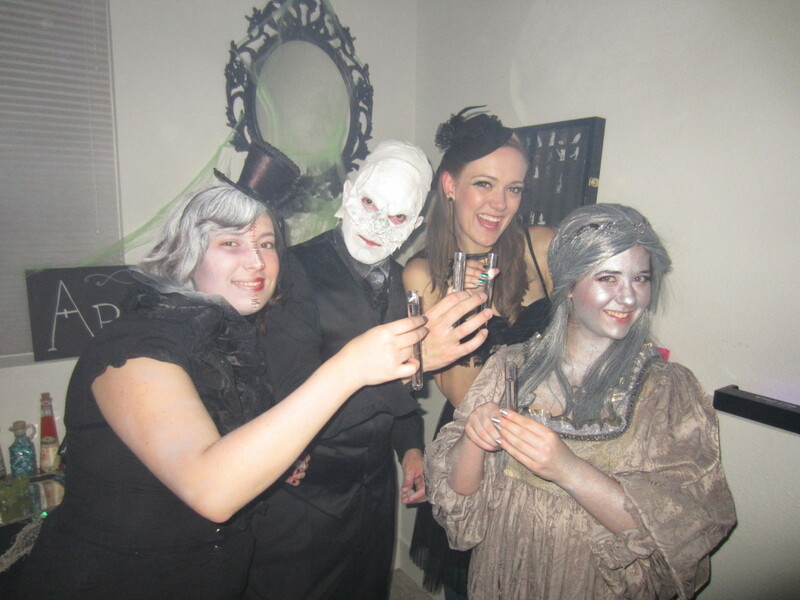 harry potter halloween party Archives - Hello, Kristina! Hello, lovely blog readers! 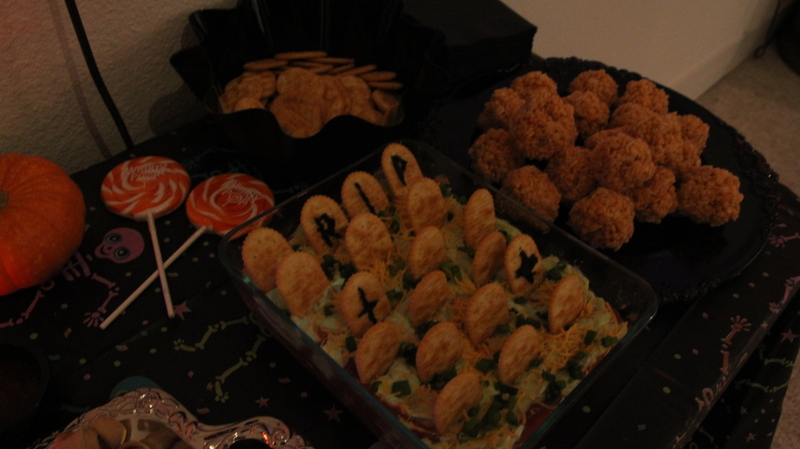 I know we’re well into November by now, but I still wanted to share with you a few photos of our Halloween party. Halloween is a big event around here for my housemates and I – we’ve thrown a party each Halloween since 2008; it’s automatic now. Halloween rolls around, we throw a party. It’s always big, loud and tons of fun. This year’s didn’t disappoint! We turned on those black-lights, cranked up the tunes and opened our doors! This is the one day of the year we actually put our built in bar to use! This is where we stuck chips and all the various bottles of booze, mixers and beer. This was the ‘fancy drinks’ table. 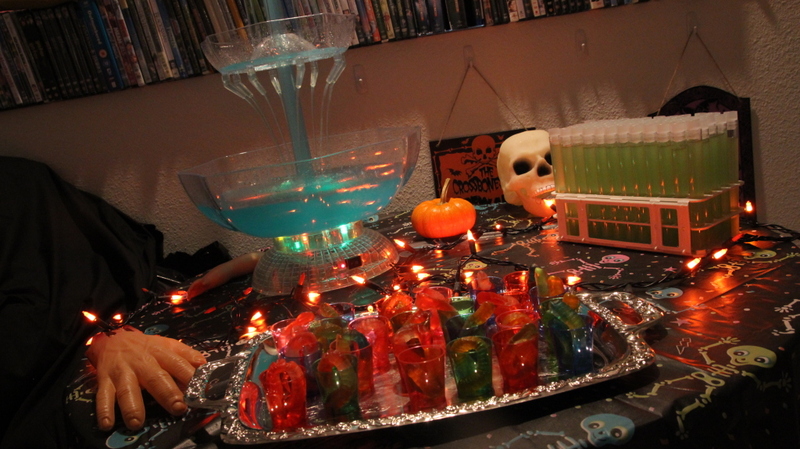 We reused our Unicorn’s Blood recipe from last year’s Harry Potter party (Blue Hawaiian Punch and whatever vodka you have lying around) in our punch fountain, vodka gummy worms (dear lord these were strong) and radioactive green test tube shots (pineapple juice, sour apple shnapps, dragonberry rum and a few drops of green food coloring). This was our food table! 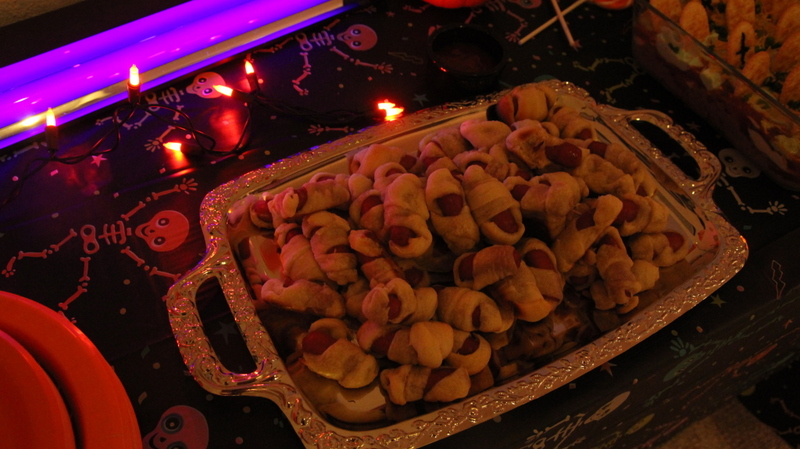 This year we had the Mummy-Rollups (weenies wrapped in crescent rolls), graveyard dip (standard 5 layer dip with tombstone shaped “headstone” crackers) and orange pumpkin-shaped rice krispies treats. Finally, it wouldn’t be a party without good ‘ol Aragog. 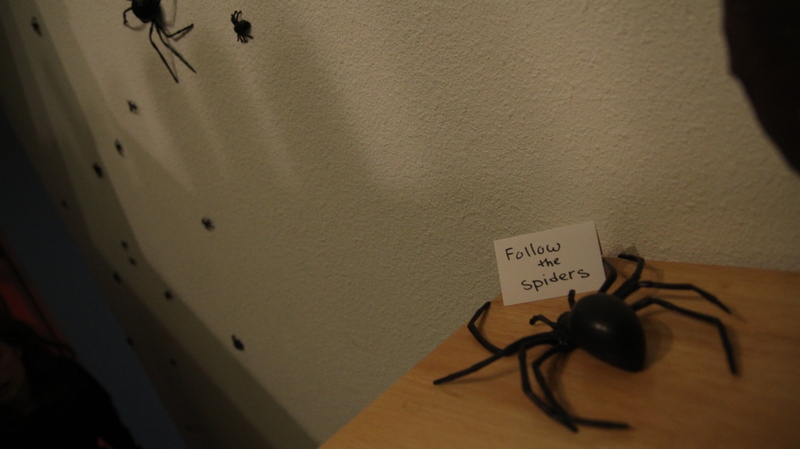 It felt like old times, having our little spider friend watching over the festivities. How was your Halloween? What did you do? What’s your favorite Halloween snacks or drink? let me know in the comments, and I hope your Novembers are off to a great start! 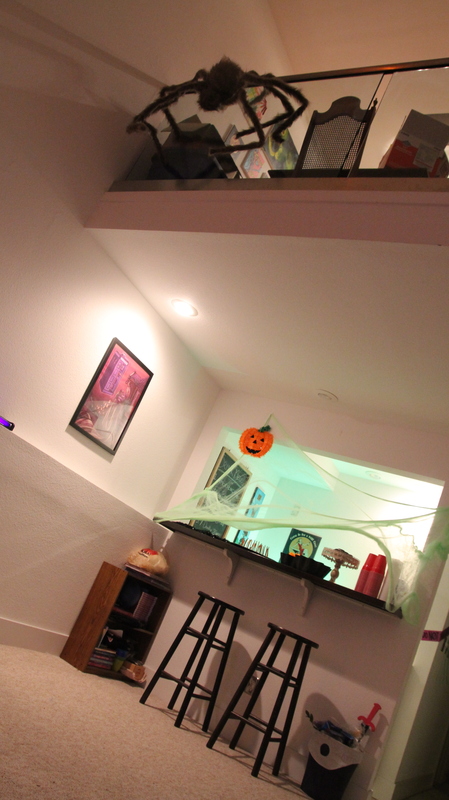 So, I have been hinting about this online for weeks – but my roommates and I have been tirelessly working on an epic Halloween party we threw at our house. I’m talking party committee meetings, organized shopping trips, and scheduled craft nights. We host a Halloween party every year, but this year… we went ALL out. Being a house full of Harry Potter fanatics, we decided it was time to give our party the ultimate theme: Knockturn Alley. 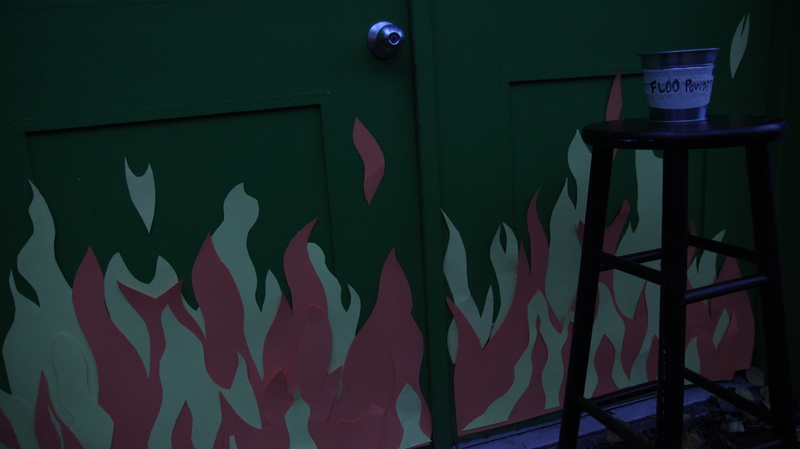 Upon arriving at our house, the first thing guests were greeted by was this flaming fireplace doorway and bucket of Floo powder. Our door is naturally lime green, so it felt only right that it would be connected to the Floo network. Wizards could shout “Knockturn Alley!” and throw a handful of sand, while unassuming muggles would mispronounce Diagon Alley as “Digonelly!” and show up in the same place. 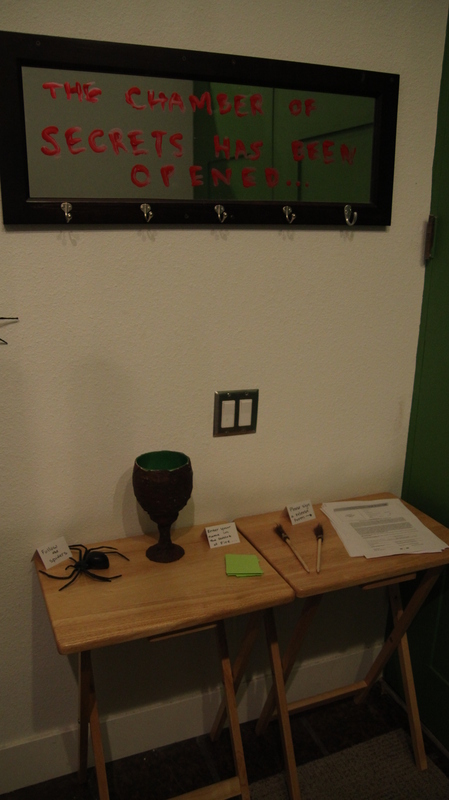 Once inside, all guests were encouraged to put their name in the Goblet of Fire. We didn’t tell them why initially (just that they might be “chosen”), then random times throughout the night my roommate Justin (dressed as Voldemort) shown a dark mark symbol on the ceiling and drew names of guests from the goblet. These selected guests would then become Death Eaters and would receive a green wrist band. Guests with wrist bands got special treatment (ie. prizes) throughout the evening. 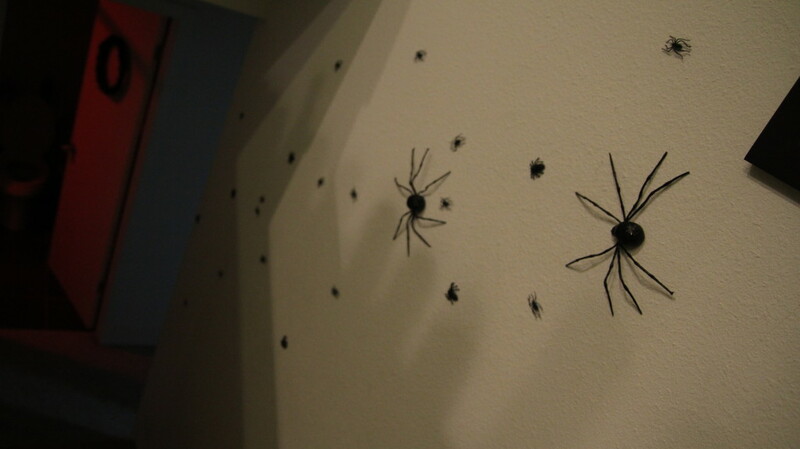 To get down to where the party was, party-goers were encouraged to follow the spiders. 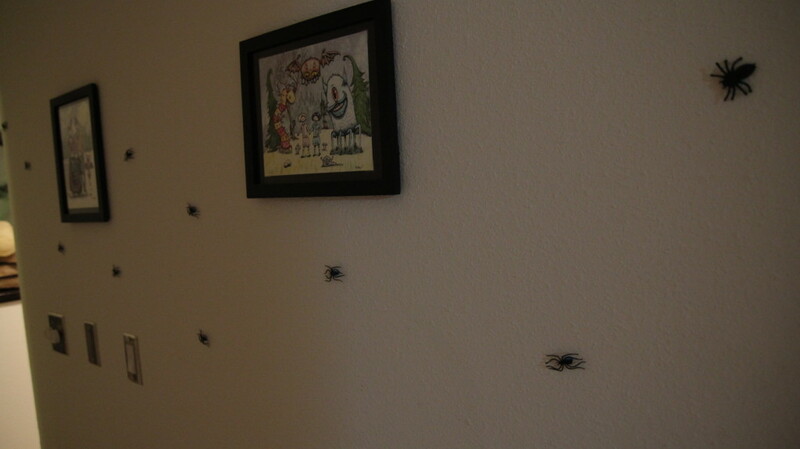 A trail of spiders led all the way down the stairs, down the next hallway and into the living room. Then in the living room, we created the illusion of the dark and creepy Knockturn Alley by covering everything in black tablecloths and shining a green floodlight across the room. Each corner had a separate “shop” with its own sign, theme, decor, food and beverages. The four shops we chose were actual ones from Knockturn Alley: of course we had Borgin and Burkes; this was the main and largest shop that took place at our built in bar. Next was the Spiny Serpent (which we know very little about from the books) so we turned it into a bestiary. The Cauldron Shop was next, which had food and drinks of and pertaining to all things cauldron-related. The final shop was the Apothecary, which mostly had interesting drinks as well as an assortment of creepy potion inspired decorations. I will have blog posts up about each of these individual shops in the next couple of days (that I will eventually link to from this post) so please keep an eye out for that! 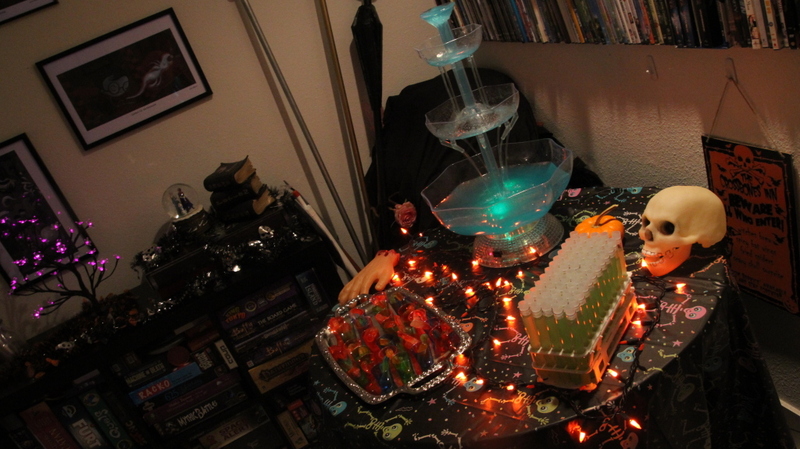 My favorite aspect of this party was that everything was supposed to be dark, creepy, and relatively colorless. 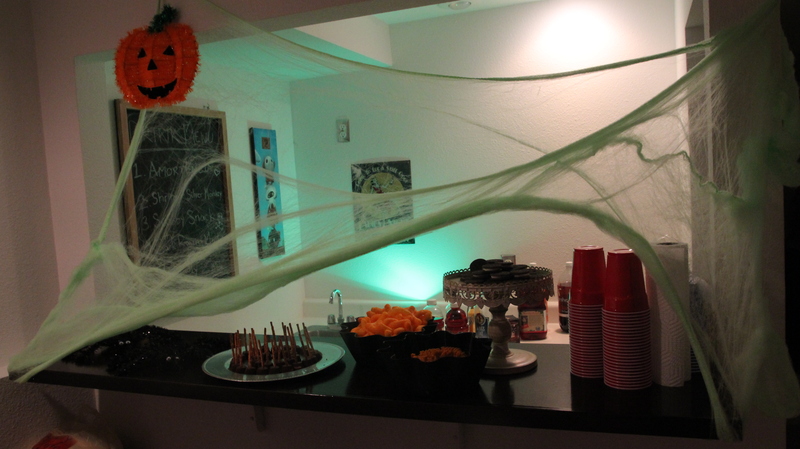 Except, of course, for the drinks (to represent potions, and a wizard party, of course). 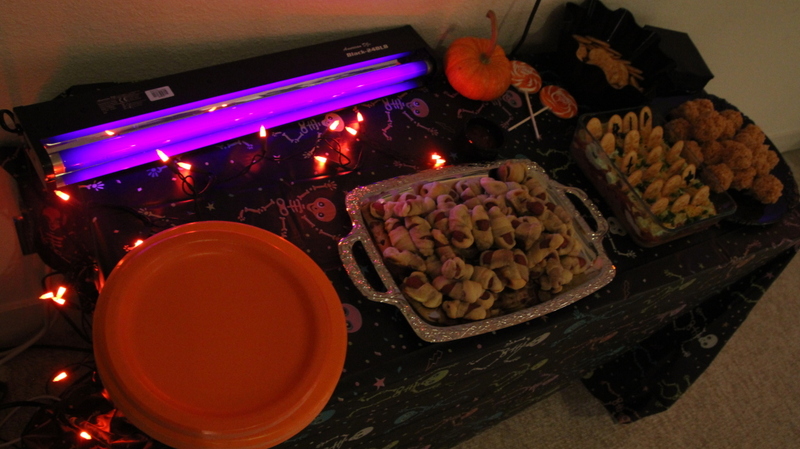 We installed four black-lights around the living room, and used UV reactant cups as well as flashing plastic “ice cubes” for the drinks, so once guests started mingling and dancing and drinking, it kind of turned into a dark wizard rave. The image of a dark, foggy room filled with people in fantastic dark wizard costumes with only glowing drinks for lights was a pretty intense, amazing visual theme for the party; one I am quite proud of. It worked even better than we could have planned. 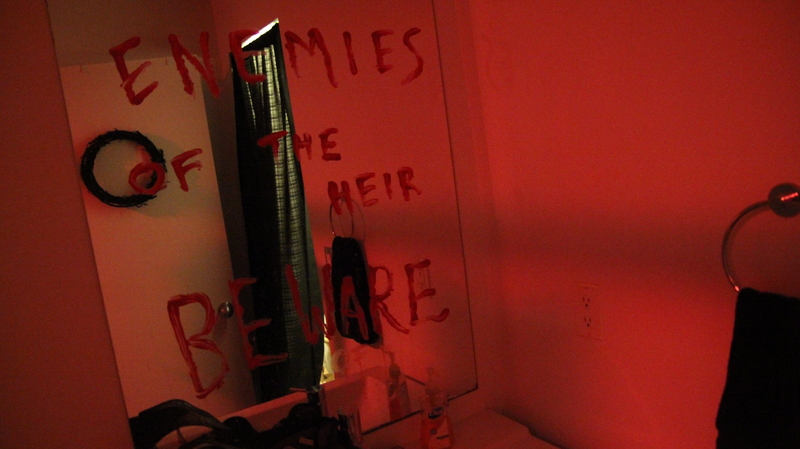 There’s so much more I want to share but I will save it for the next blog posts; in closing I will leave you with the creepiest aspect of the party: the bathroom. 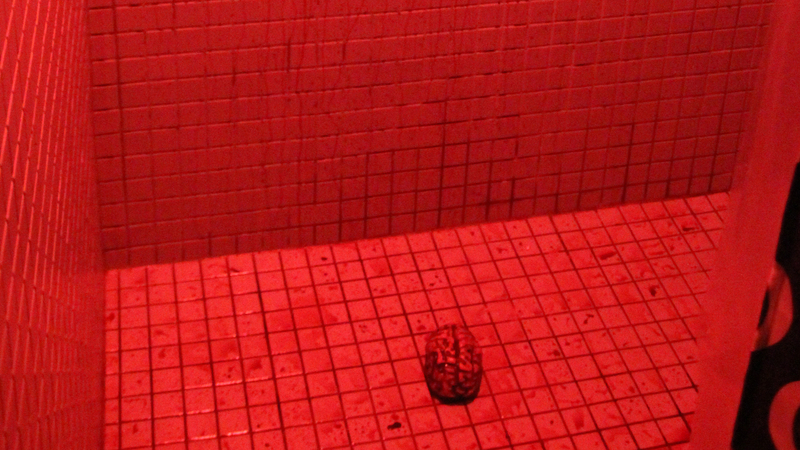 I tied it in by saying the brain was one from the Department of Mysteries… but even I’ll admit that was a stretch. I just wanted to freak people out. It was a fantastic night, everyone seemed to have a lot of fun, and I was so thankful for all of the help I had in pulling it off. My roommates were absolutely amazing in helping get everything ready, as were a handful of my friends who came over early to help us finish setting up. My roommates! Liz as a shop keeper, Justin as Voldemort, myself as Narcissa and Eia as the Grey Lady. I don’t know if I’ll ever throw a party quite this grand ever again, but I’m pleased to be able to check it off my list. I don’t know if other people have thrown Death Eater or Knockturn Alley parties before but we had so much fun scouring the books for ideas. 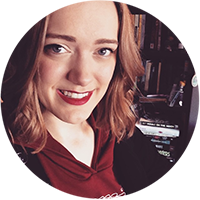 I’m curious to know your thoughts, as I know many of the people who read my blog are also huge Harry Potter fans! How did we do?